Tomorrow is All Saints Day! Halloween has grown on me since having children, and I certainly love to deck the house in black and orange this time of year. As catholics, I like to make sure our Domestic Church is also decked for All Saints Day. This year, I decided to just focus on the dining room. We’re having friends over for a fire pit after trick-or-treating tonight, and we’ll serve food and drinks, so I need all the Halloween decorations from the dining room for the folding tables we’re putting outside anyway. 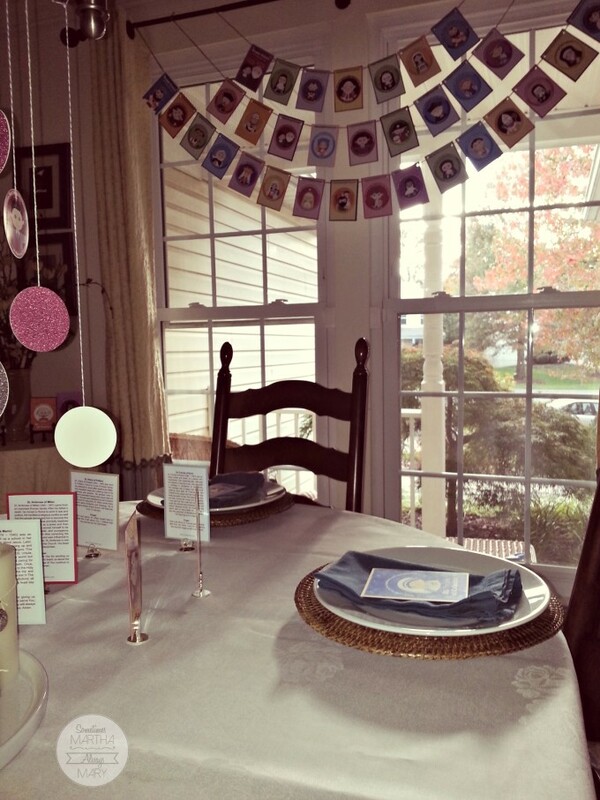 With a clean canvas, I was able to decorate the dining room from top to bottom with Happy Saints printable downloads. (This is not a sponsored post. I just love telling everyone about Happy Saints!) Victor Teh has done it again with his eighth e-book. I was so excited to see that he included Sts. Louis and Zelie Martin in this one! So darling. I love how colorful the Happy Saints are, so this year I decided to punch out the circle saints and also print out the larger holy cards. I used a hot glue gun and glued a little bit of baker’s twine between the saint circle and the glitter paper circle. 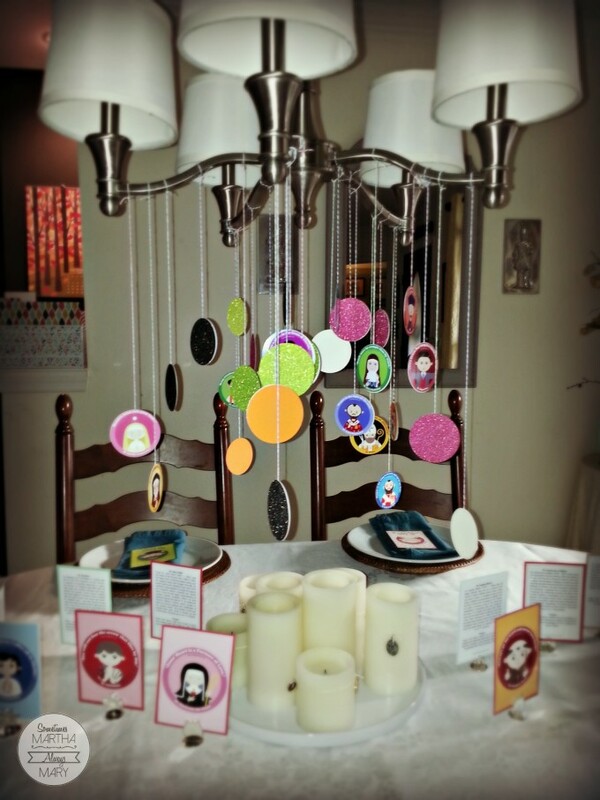 Then I just tied them all over the chandelier above our dining room table, like a shower of saints coming down from heaven to celebrate with us. I have place card holders that were given to us as a wedding gift that I use all the time. If you don’t have some, I highly recommend adding them to your list of things to ask for as a gift. 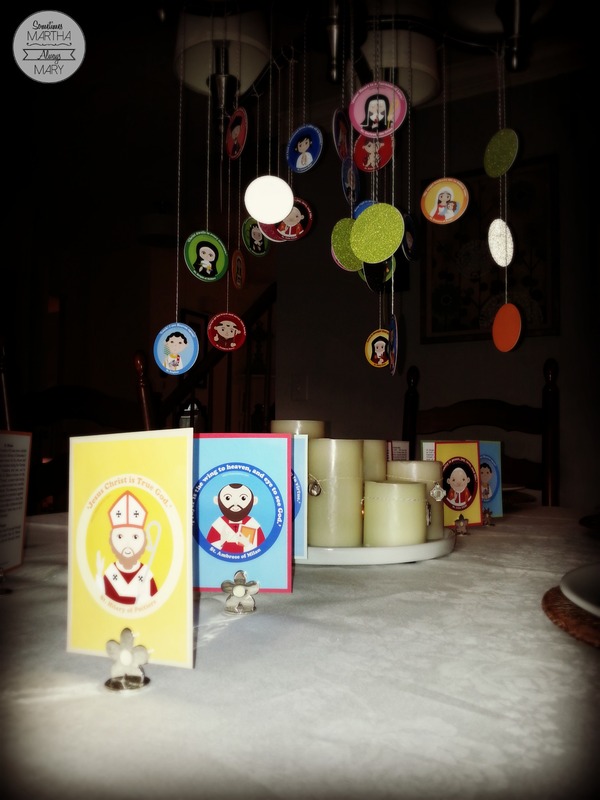 So our little Happy Saints are standing all over the table and on the back of each I glued the little history of the saint and prayer to the saint which comes with the e-book. 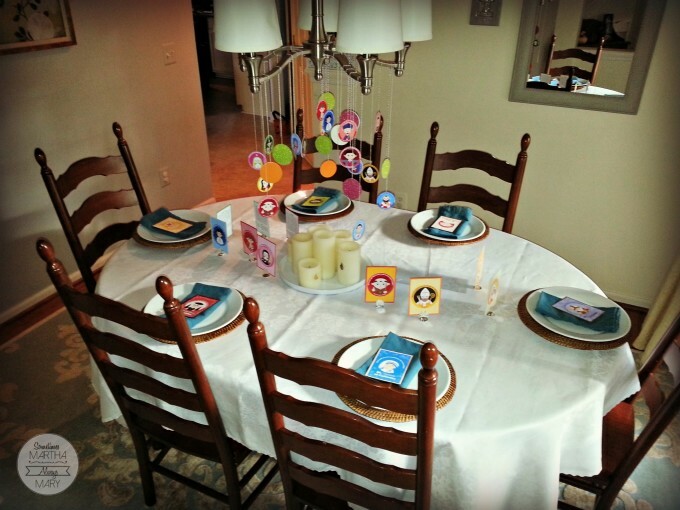 I also placed one saint on top of each linen napkin and place setting. These little picture stands are so useful too! I got them at Bed, Bath, & Beyond a while ago and I use them all the time. More Happy Saints for my little side table in the dining room. 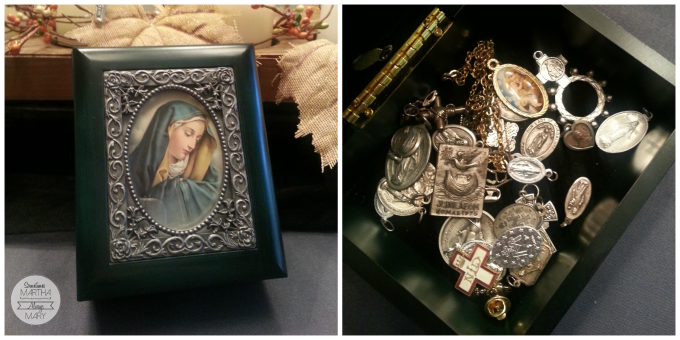 Do you have a box like this, filled with saint medals that you never wear? Well, I came across this darling idea on Pinterest. It’s from Catholic Inspired and it couldn’t be easier. 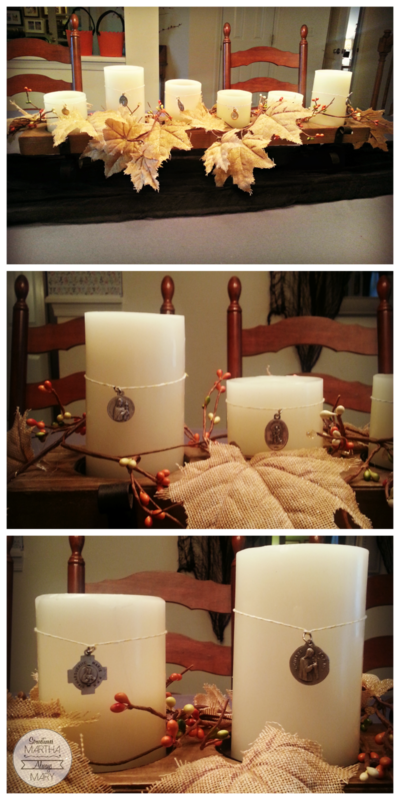 I tied my medals to some bakers twine and simply tied the twine around the outside of my battery operated pillar candles. Cute, right? I love them. For a couple days I had them on my candle holder that I decorated for fall, but I didn’t want to take away from my shower of Happy Saints, so now they’re on a simple white tray, all grouped together. And that’s about it! 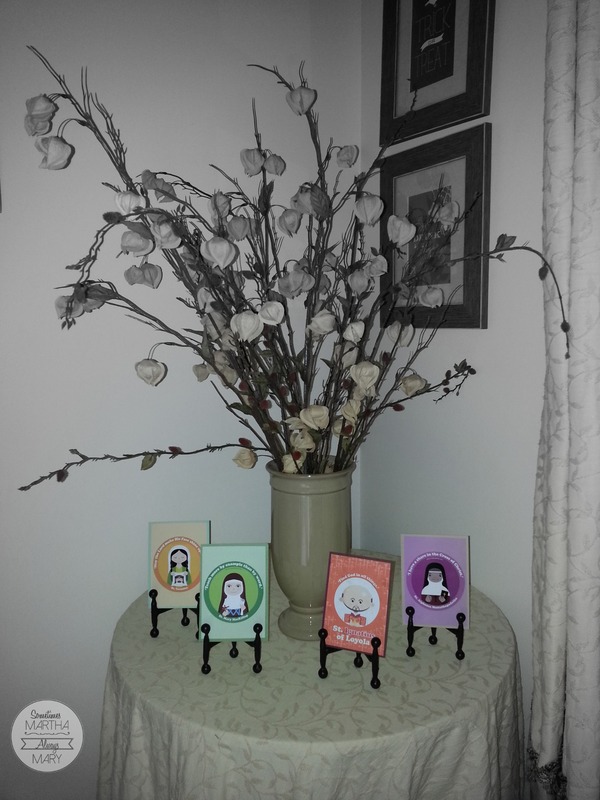 If you don’t want to download a Happy Saints e-book, you could always hang your holy cards on a ribbon or string across your mantle or over a window with clothes pins. 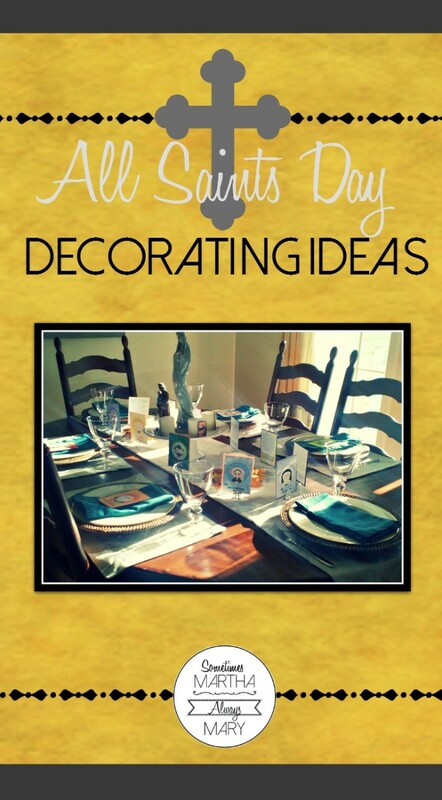 Check out my Pinterest All Saints Day Board for more ideas from other better bloggers! I know, I feel badly that I didn’t post this sooner for the sake of the folks who would want to decorate too, but I just didn’t get around to making everything and decorating until a couple of days ago. Next year I’ll re-post this a couple of weeks in advance!